3. 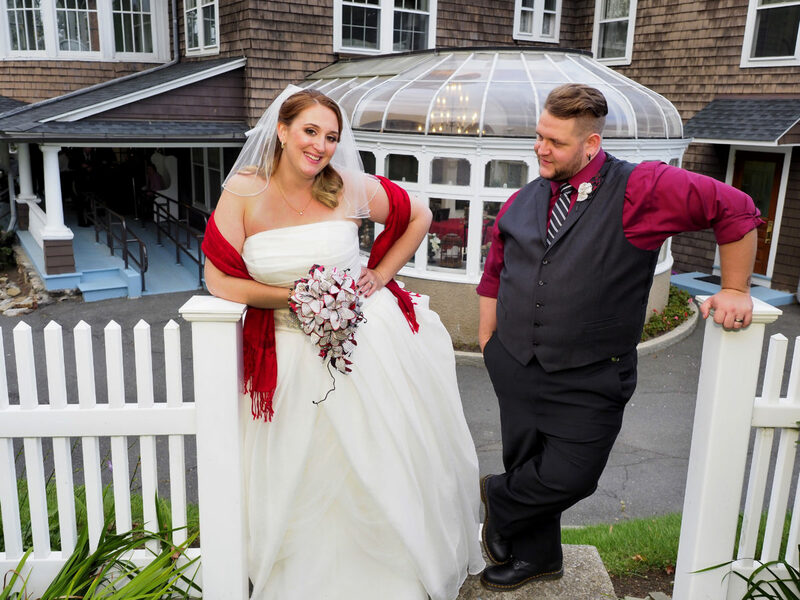 Adjectives to describe your dress/attire: Ivory ballgown, red shawl from my aunt, shoulder length veil from Etsy, and my favorite – red sparkle heels from Irregular Choice! 3a. Repairs or dry cleaning post-wedding? My dress lost a hook for bustling after the ceremony! But, I had already gotten a plan with the store to have repairs and cleaning post wedding prior to having the dress preserved. 4. First look? We did our first look at the top of the stairs inside the manor. We were both so excited to be getting married, we couldn’t stop laughing. It was such a special moment to share just us before the nonstop activity! 5. Goldilocks your party: too much, not enough, just right: JUST RIGHT. We still get feedback from our friends and family about how much fun they had, how great the food and staff were, and how they had never been to a more fun wedding. We would go back and relive that day in a heartbeat. 7. Most surprising: How fast the whole day went. People will tell you how things fly on the day of your wedding, and they aren’t kidding! 8. Standout memory: Seeing my husband at the end of the path underneath the grape arbor, with all the people we love there, just before my father and I came down the aisle. It was so special. 9. Honeymoon when/where? We left three days after the wedding for a week in Disney World. 10. Would you change anything? There were small things that didn’t go according to plan through the day- but we wouldn’t change one thing. We knew Tarrywile was the perfect location as soon as we saw it, we trusted our caterer Chris from Carriage House as soon as we met him. Our day would not have been as special anywhere else! !